As I began this project of recording the history of DXing in New Zealand, it quickly became apparent that I keep to my original aim and not end up writing a history of broadcasting in New Zealand. At times this was difficult as the history of the hobby of DXing is so closely intertwined with the growth and development of broadcasting. Initially this history of DXing deals mainly with the broadcast band. Shortwave was still developing in the late nineteen twenties and it was not until the early thirties, when dual wave radios became more readily available to the general public, that shortwave listening became another medium for DXing. Broadcast DXing was for many years and still is considered by some, to be the ultimate mode of DX. At that time, low noise levels and the limited transmission hours of New Zealand stations, were most conducive to distant broadcast DXing. World War II and the Cold War that followed, led to the dramatic growth in shortwave broadcasting. So often we leave things too late and always regret that it was never done earlier. Documenting the history of DXing in New Zealand is an example. Those DXers who were involved in the development of our hobby in New Zealand have now passed on. Some I have met: Cyril Blucher 1928, Alan Breen 1930, Eric Watson 1931, Merv Branks and others. Of course we talked of DXing but never did I record their recollections of the early days. Fortunately some DXers, such as Arthur Cushen, Jack Fox, Merv Branks, John Stuart and Wally Singleton, who started listening in the mid thirties have written historical and reflective papers. These I have referred to in my research. We are thankful that these DXers did record their knowledge; in particular, Wally Singleton for his detailed history of the NZ DX Radio Association. Although I have been actively DXing for over 50 years, this history is taken more from research rather than recollections. I have been fortunate in having sufficient reference material on hand, to enable me gain an insight into the founding of the hobby and its development over the last 75 years. I believe it is an accurate, if not comprehensive, history of DXing in New Zealand. located in Dunedin, initially used the call sign “DN” and was reported as far away as Hamilton. By February 1923, a second station was on the air, when Charles Forrest of the International Radio Company began broadcasting music and speech from Courtenay Place, Wellington, on Mondays and Fridays from 7.30 to 9 pm. Auckland was next on the scene in the middle of the year when Radio Service Ltd began broadcasting on Saturday afternoons with much the same commercial motivation as Forrest. electricity supply was not yet in service). Six years later the government decided to create a Broadcasting Board to take over the running of these stations. Privately owned stations were known as “B stations” and these continued to operate as before but with some financial difficulty. After the election of the Labour Government in 1930, two new boards were formed: the National Commercial Broadcasting Service, and the NBS, National Broadcasting Service, which was later absorbed by the NCBS. October 1936 saw 1ZB been purchased to become the flagship of the Commercial Network. 2ZB, 3ZB and 4ZB followed in 1937, and 2ZA in 1938. Private stations continued to exist and in 1938, there were 16 government-controlled stations on the air, and the remaining 9 were privately owned. By the end of 1940, only four private stations remained: 2ZJ and 2ZM in Gisborne, 2YD in New Plymouth and 4ZD in Dunedin. 4ZD continues broadcasting today as 4XD, the oldest radio station in New Zealand and the British Commonwealth. page magazine selling for one shilling and published by L.T. Watkins Ltd., covered the current news and development of broadcasting around the world. In the March 1923 issue, there appeared articles such as “What is Broadcasting”, “How to Listen”, “Our Shortwave Problem”, “British Regulations for Receiving”, “Broadcasting in the United Kingdom”, “Amateur Radio” etc. 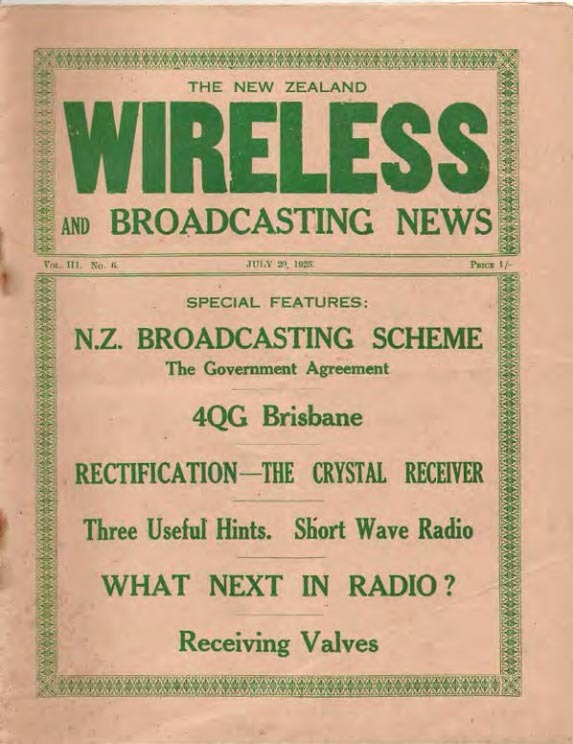 By 1925, the magazine was including regular features about Australian and North American broadcast stations and lists of NZ Australian and North American broadcast calls. Some readers were sending in lists of morse signals heard, amateur and commercial. There were even reports of reception of KDKA Pittsburg, USA, with music. One report of KDKA was on a 2-valve receiver. By the late 20s broadcasting in New Zealand was well established and growing, and for some listeners, the thrill of hearing stations further afield than their local ones became a challenge. After hearing the local station, some listeners would look for the high-powered national stations and the lower powered regionals. The occasional Australian station would be heard and possibly even an American broadcaster. One must remember that the radios of the late 20s were crystal sets and TRF or neutrodyne battery sets, many of them home-assembled from kit sets. Aerials were essential and ranged from indoor loops to extensive outdoor wire antennas. It was also around this time that the beverage antenna came into use by the keen listener who had the space to run out the very long wire. Great emphasis was put on the need for an effective earthing system, remembering that there was no return earth through an AC power supply as most receivers were battery powered. Few receivers had a single tuning dial, and tuning in a station normally meant the manipulating of several knobs. The dials only gave an approximation of the wavelength and it was essential that the call sign and location of the station was heard. Access to reliable reference material was very limited. Despite these hardships, a growing number of listeners continued to search for distant stations. There is little doubt that American broadcast stations were heard as early as 1923. One DX magazine in 1933 made mention of the earliest known North American DX verified by W.K.Lane: KFI on 640 kcs in September 1923 and CFRC Calgary on 690 kcs in October 1923. By 1925, stations such as KGO Oakland, KHJ Los Angeles, KXAA Cincinnati, WOJ Chicago and WEBH Chicago were being reported in New Zealand. KFON Long Beach was undoubtedly the most regular American heard in 1926. Some remarkable loggings were also being made- CKAC Montreal 1200 watts and KFKX Chicago 5000 watts. 1928 brought in the first “ship station” in southern waters, ARDI on 700 kcs, broadcasting from the ship “C.A.Larsen”. In 1929 the DX fraternity had grown throughout New Zealand and more new DX stations were being heard, such as KFKB Kansas 5000 watts and KJEK Santa Monica 500 watts. Shipping was now frequently heard calling VK2ME with calls like VJNM, VJNL and VJNK, all operating on about 1420 kcs. 3EK, an AWA “model station” operating from the Melbourne Radio Exhibition, was one of the most consistently heard Australian stations heard in New Zealand at this time. By 1930 the AC powered receiver was becoming more popular and many more listeners were catching the DX bug. In September that year, the first European stations were heard on the broadcast band and Bratislava Czechoslovakia later became the first European verified. Africans were the next to be sought and several were reported in 1931. After being involved in the radio industry in the USA for four years, the New Zealander E. H. Scott and his New Zealand wife, decided to return to New Zealand for a holiday. Scott was determined to build a top class receiver and receive North American broadcast stations while in New Zealand. He had some information to encourage him that such reception would at least be possible. In March 1924, a broadcast station WJAS located in the Edgewater Beach Hotel, Chicago, received a letter dated January 31 st 1924, telling of the station’s reception from Motueka, Nelson, New Zealand. According to the newspaper article, this reception broke all previous records for long distance reception. Scott realised that he would need to build a sensitive and selective receiver for the reception of the low powered 500 – 1000 watt American stations from New Zealand. He had had experience with the neutrodyne, tuned radio frequency, and superhetrodyne circuits. Based on all his knowledge he concluded that the superhet was the right choice for the finest receiver he could build. He chose the basic Remler 8 tube superhet components (kitset), which were the basis of the Westinghouse 4B receiver. Westinghouse then held the license for the production of the superhet. Drawing on past experience Scott made several modifications and improvements to the Remler circuit. A key circuit change was to use two tuned IF and two untuned IF stages instead of the one / three combination. Scott attributed his success in New Zealand to the fact he used two adjustable tuned IF stages, instead of the normal one fixed tuned stage Further, Scott paid special attention to the layout and the use of the highest possible quality components. The receiver was finished while Scott was still in Chicago, and while testing it in November 1924 he picked up 2LO in London and a Mexican station. Shortly after, he left Chicago for San Francisco armed with his new receiver and antenna. While travelling across the States, Scott had written to WEBH Chicago and the station agreed to conduct a special broadcast for him, after midnight on New Years Eve. By that time he would be in Tasman, Nelson, New Zealand. Further special broadcasts were arranged from other Chicago broadcast stations – WGN and WOJ. In January 1925 when Scott was finally in New Zealand, he did not have a very happy month of reception. The situation did not change dramatically until he received WGN’s special broadcast on January 29th. WEBH was finally heard on February 8 th from 8.06 to 8.43 pm when the station identification was heard: “WEBH, the Voice of the Great Lakes, Chicago”. The reception of WGN from NZ made the news in the Chicago Tribunal newspaper. The full identification heard was reported: “This is WGN, the Chicago Tribunal station located at the Drake Hotel Chicago, transmitting a……”. During February, Scott also picked up a special transmission from WQJ Chicago. That programme transmitted on February 18 th was logged for over 2 hours. A cablegram was sent to WQJ, which was jointly owned by the Calumet Baking Powder Co. and the Rainbow Gardens, quoting the highlights of the programme heard. During his three months in New Zealand, Scott made 100 loggings of 20 different American stations. He continued his logging till April 10 th with one new station heard WHB, Kansas City, Missouri. In a letter to WCBD he included a copy of his log book. It showed stations logged by him at Tasman from December 27 th 1924 to March 27 th 1925. Most of the stations were heard between the hours of 6.00 and 7.30 pm. The following log sheet was included in Scott’s letter to WCBD. one considers Scott’s professional approach taken in achieving his stated aim, the use of a home made receiver, the fact only a loop antenna was utilised and his dedication at the dial, I believe that he will certainly take a place in the history of DXing as the “Dean of DXers”. During the 1920s some amazing feats of DXing were achieved. An Australian journal of 1925, reported that 2BL Sydney, 1000 watts, had received correct reports from Warsaw (USA), New York, San Pedro, Terminus Island. and San Francisco, while 4YA Dunedin 750 watts, was being heard all over New Zealand, Australia, Fiji, USA and Fanning Island in the Central Pacific. In 1926 excellent reception was reported by New Zealand listeners of KFQN Long Beach and KGO Oakland, while Mr Stone of Balclutha forwarded details of a complete programme heard on WENR, a station in Chicago listed at 100 watts. In 1927 reception was reported in the New Zealand publication “Radio Record” of an American DXer, Mr Walter Pierce, Rhode Island, USA, using a 2 valve radio and an “exceptional earth system”, hearing 691 stations, including 4 New Zealand ones. He reported details of reception of 1YA Auckland, but these left some doubt as to the quality of his report. on phones; KZM, KZRC, JOAK, JOCK, KFON, KFI, KFO, KGO, KNX, KDKA, KYW, WBBM, WLW, WGY, WEHF, KOA, KGU, KFVD, KPKX, KFF, KFSD, WORD, KNRC, KOP, VJY and CMRU. The same issue made mention that a Mr Douglas Wright of San Pedro, California had reported reception of 3YA Christchurch, heard on a 10 valve deluxe Super Zenith. it was obvious they listened to whatever radio station they could pick up; broadcast stations, shipping, radio amateurs, shortwave and morse. The radios varied from crystal sets, home-made valve radios to commercially manufactured radios. One listener in Hokitika reported hearing 4QG Brisbane, a distance of 1300 miles, 2BL Sydney and 5CL Adelaide, all on a crystal set. Another listener in Wanganui had heard 5CL on his crystal set and queried whether the distance of 1600 miles was a record. One article in the November 1926 issue featured Mr O.T.Guest who, on a home-built radio described in an earlier issue of the magazine, had heard KGO California. He had added a 2-valve amplifier to the one valve radio to give speaker reception of KGO. The magazine contained much information regarding the rapidly changing scene of broadcasting and wireless in Australia and New Zealand. In May 1926 the magazine featured the new 1YA transmitter and studios to be located on top of George Courts building in Karangahape Road, Auckland. The new Western Electric 500 watt- transmitter would make 1YA the most powerful broadcast station in New Zealand. A photo of George Courts shows the two 100 foot lattice masts on top of the building. Right from the first issue of the Radio Record there was frequent reporting of current shortwave news, such as the new Empire Service of the BBC, American and foreign broadcasters and broadcasts from Holland. Every few months updated lists of American and Canadian broadcast stations appeared along with shortwave frequencies. But this was topical news aimed at the general listener, rather than the DXer. 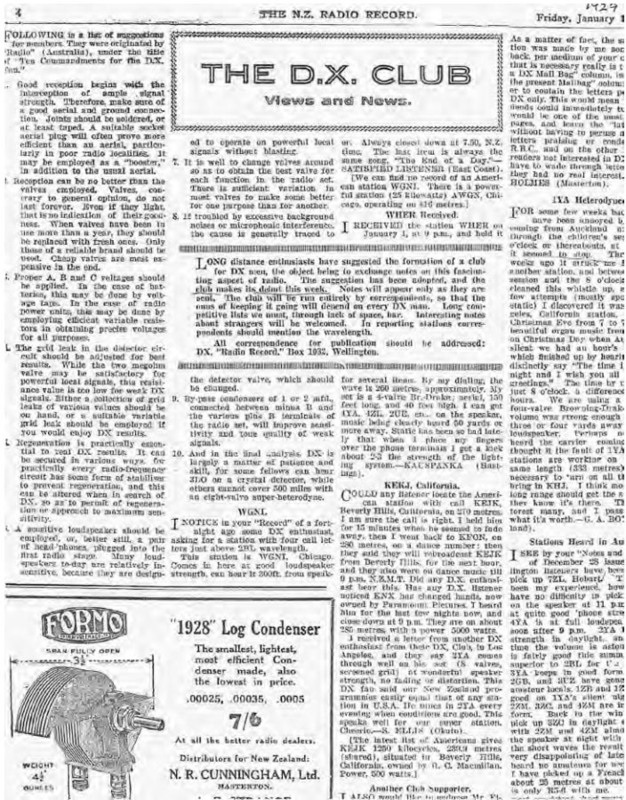 It was not until January 11 th 1929 when the first page was devoted specifically to the “DX Club”, that news and views entirely for the serious DX listener was printed. This rapidly grew in volume and depth of information. Racecourse. He soon wanted a set of his own but quickly discovered that of a 5-valve radio retailed at about 65 pounds. After much discussion a cheaper 3 valve reflex radio was purchased. It proved to be a splendid “distance getter”. The most common stations heard were 1YA, 2BL, 2AC, 4QG and 2FC, while on one evening a Japanese station was finally identified. receiving his reply, Mr Ellis heard and logged his first American station KFON on 17 th April 1928. Mr Ellis heard dance music, then the station announcement, “You are listening to KFON where your ship comes in, at Long Beach, California. You are listening to the music relayed from the Majestic Ballroom by remote control.” On June 6th, Mr Ellis was successful in bringing in KGER, which was then only 100 watts. Both stations confirmed reception: a letter and an interesting and prized folder on KFON, which was known as the Piggly Wiggly station. This folder, which only a few DXers ever received, was considered rare in the early days. KGER mentioned that Mr Ellis’s report was the first received from New Zealand. He was now a keen DXer. Mr Ellis then commenced recording his reports in the “Mailbag” page and these were followed by reports from other listeners who were also listening to the American broadcast stations. Shortly afterwards Mr Ellis wrote to the editor of the Radio Record on the subject of having a DX Club. His letter was published in the magazine and the idea was supported by Messrs G. Holmes, C. Blucher and R. Crabbe. As a result they were granted a special page in the Radio Record where ideas and reports could be exchanged. Letters then came in from all over New Zealand. Below is a random selection of interesting notes and items taken from various issues of the Radio Record published in 1929. This magazine was published weekly so one would suspect that the local DX material was reasonably up to date. We start with an extract illustrating the difficulties in finding the correct wavelength on most of the receivers of that time. During the 1920s, the tendency was to quote the wavelength in metres, but as 1930 approached this gave way to listing the frequency in kilocycles.. In the August 23 rd DX NOTES, a request for identification illustrates the difficulty in identifying stations heard. “A Japanese station between 1YA and 2BL, slightly nearer to 1YA”. Another Japanese “2 degrees below 2LO”. Another Japanese, “Just above 4OG”. In the same issue “Kuspanka“, the non-de-plume of a Hastings listener gave the full list of Japanese stations currently operating and taken from a QSL card just received. All stations were 10kW except JOCK, which was just 1 kW. The calls were JOAK 870 kcs, JOCR 810 kcs, JOFK 850 kcs, JOGK 790 kcs, JOBK 770 kcs and JOIK 820 kcs. Kusopanka had just received his 34 th American verification with KSFD. His stations had all been heard on his 4-valve radio. In another issue of the Radio Record, we read, “I am enclosing a copy of a letter received by the last Frisco mail, in reply to one sent, asking for confirmation of reception from WTIC, Hartford, Connecticut.” From the letter we read, “The report to WTIC was one of five we received from New Zealand in the same mail.” WTIC included an EKKO stamp and schedule with the verification letter. WTIC ran 50kW on 1060 kcs. E.H .White, of New Plymouth, reported the above. Hearing American stations was the cream of DXing, but New Zealand and Australian stations were still keenly sought after. Some must have been difficult to hear at times with their low transmitter power. An example of a low power station was 2ZD Masterton, operating since April 1929. The hours of transmission were Mondays, Wednesday and Saturdays, noon to 2 pm; and Tuesday, Thursday and Saturday, 7 – 9 pm. This station operated on 254.1 metres with a power of 8 watts. The aerial was 180 feet long with an earth return. Reports from Taranaki and the Waikato show that daylight reception was good. The transmitter was assembled in the workshop of the owner and operator, Mr W. D. Ansell. “Owing to the heavy demand made on our space, and to the increasing amount of correspondence received from DX enthusiasts, we have found it necessary to request the following courtesies. By May 1930, the DX Club section had grown to two pages and the indications were that, as the popularity of wireless grew in New Zealand, so would the hobby of DXing. The early 1930s saw tremendous growth in the popularity of wireless, as more and more radios became part of the household. As radio sales increased, so did the interest in the hobby of DXing as listeners attempted to see how far their new set could reach. The two-page restriction of the DX notes in the Radio Record could no longer cater for the growing interest. Keeping in mind that the DX Club was basically run by the publishers of the Radio Record, with the commercial view of selling magazines, a decision was made to publish a new publication catering especially for DXers. Although there were no elected club officers, there was, in name only, a “President”. The winner of the 6 monthly DX competition was appointed as president of the club, the first president being Mr S. Ellis. pages previously issued in the Radio Record, and was still edited by the publishers of that magazine. Commercial profit was still a major consideration, with several full page advertisements featuring RCA Radiotron valves, Stewart Warner radios, F. J. Fear & Co., Crosley Radios, Te Aro Book Depot, Majestic Radio and Ultimate Radio. On the inside of the back cover, details of the publishing of the Radio Log were printed. Subscription rates 6d per copy; 6/6 per annum post-free. Published monthly, approximately 20 th . Address literary matter: Editor, “Radio Log”, PO Box 1032, Wellington. Business communications: “Radio Record”, PO Box 1032, Wellington. Printed by the Commercial Printing and Publishing Co of NZ Ltd. Published by Roy Cecil Temple of Te Kainga, Khandallah, publishers for the owners, The Radio Publishing Company of NZ. The content followed that as previously seen in the Radio Record, but enlarged to include articles on overseas radio stations, DX Club news, DX news of the month, the monthly mail, monthly station logs which were quite basic compared with today’s magazines, amended calls and DX Club notes. Vol. 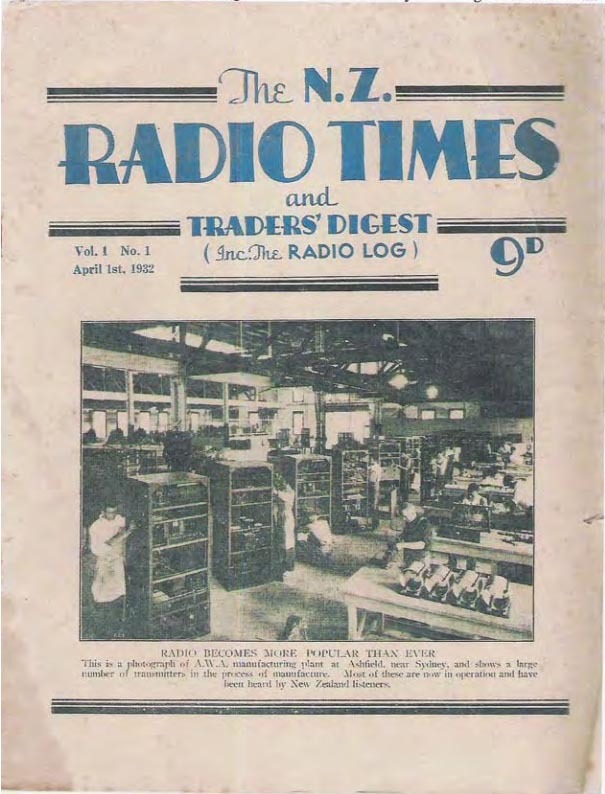 1 #8, dated February 20 th 1932, was the last issue of The Radio Log as a separate publication. 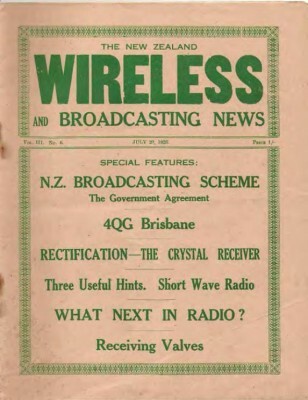 The next issue was to be incorporated in the “New Zealand Radio Times”, a new monthly magazine established to cater for the growing interest in wireless. The new and bigger magazine was to broaden the scope by including technical and instruction features. Probably The Radio Log, priced at 6d, was not a viable commercial proposition catering for DXers only and the market base had to be expanded. It is difficult to assess the actual number of financial members of the DX Club, as I believe that although there may have been over 400 members, they may not have all been financial. The membership was now increasing by over 20 a month but that may have not taken into account the non-renewals. As well as receiving the magazine by subscription, there were limited sales through selected retail outlets. be competed for every 6 months. The Radio Record, when donating the cup, stated that the object of the competition was to stimulate long distance reception. The handsome silver cup was to be presented to the listener with the largest number of overseas stations verified. The actual cup remained the property of the Radio Record, although an engraved miniature was given to the winner. A certificate was awarded to each district winner. The winner was the DXer who sent in the largest log of verified stations as of June 30th and December 31st, making it a 6-monthly competition. Stations eligible for the competitions must transmit on frequencies between 545 and 1500 kcs. (1500 kcs was at that time the top of the broadcast band.) All stations must have verified and, upon request, the competitor must provide a QSL card, verification letter, or EKKO stamp as proof. It is interesting to note that although an EKKO stamp was considered a verification in its own right, most American stations verified New Zealand DXers with a covering letter as well as an EKKO stamp. daylight and the verification stated so. The winner of the DX Cup automatically became the President of the DX Club for the period the cup was held. The decision of the judge was final. Entries were to be typed out in accordance with requirements. The DX Cup, which had been presented in July 1930, was the major DX competition run by the DX Club. Monthly DX competitions had also been introduced but were dropped due to lack of interest. In 1932 another cup, the Fraser DX Cup, was presented for the best logging made on a battery- powered receiver. An unusual move, as battery-powered receivers were rapidly becoming obsolete. For the first period, July to December 1930, the DX Cup was won by Spencer Ellis (DX5T) of Okato, Taranaki, with 89 stations. The next period, January to June 1931, it was won by Morley Stafford of Pehiri, Gisborne with 142 stations. Again, in the July to December 1931 period, Morley Stafford won – this time with 227 stations. The January to June period 1932 saw a new winner, F.W. Barnett (DX 760T) with 291 stations. Frank Barnett was the president of the Otago Branch of the DX Club, and owner/operator of 4ZO Dunedin (25 watts on 1050 kcs). Frank was a popular and well-known figure in radio circles in the South. The January to June 1933 competition saw Frank Barnett increase his log to 366 stations and again take the cup. J.P. Cowlishaw of Palmerston North was the winner of the next competition period, January to June 1934, with an impressive total of 500 verified stations all heard since 1930. Mr Cowlishaw described his set up as a commercial 8-valve TRF receiver purchased in August 1930. Up until the last 6 months all his DXing had been done on a speaker but he then changed to earphones, particularly for the low powered VKs. The antenna used was 90 feet long and 65 feet high, running north and south. The earthing system was comprised of a copper kettle with a 1 inch copper pipe attached and buried 5 feet deep. This was joined to 4 perforated galvanised iron pipes driven into the ground at intervals. A single wire connecting all of these ran to the earth terminal of the radio. retained as the DX section of the new magazine. No change in format was made to the Radio Log and it continued to contain club news, new station news, the monthly mail, amended calls and other items. Membership now numbered over 600 but still no indication as to the true financial membership, which I believe may have been somewhat less. It was reported in the May 1 st 1932 issue that Eric Watson (DX 28MC) had successfully organised the first Christchurch branch meeting of the DX Club. The meeting was informal and attracted a good gathering with talk, centering on DX matters. In the same issue of the NZ Radio Times, Mr R. Kerr of Auckland was endeavouring to raise the interest of Auckland members in forming a local branch. However the first branch was formed in Dunedin with a very enthusiastic gathering of 22 DXers who met at the RSA clubrooms on April 13th. A full report of the meeting and election of officers appeared in the Radio Log. By the end of the year there were NZ DX Club branches in most main centres in New Zealand. 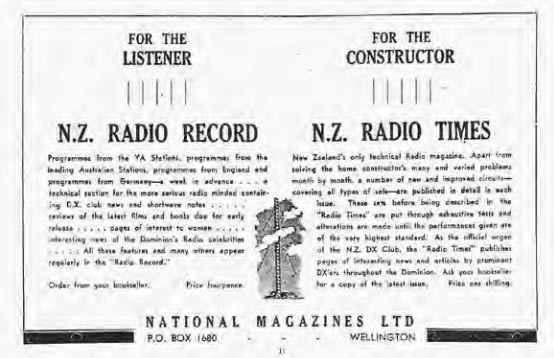 In January 1933 the size of the NZ Radio Times was enlarged and the contents expanded. However the Radio Log retained its same format and number of pages and still only covered broadcast DX, despite the increasing interest in shortwave DXing. The larger Radio News remained at 56 pages but the Radio Log DX section increased to around 16 pages. This increase appears to be partly due to the transfer of overseas broadcasting articles from the main body of the magazine to the DX section. The format of the Radio Log changed little over the next few years. In the December 1934 issue, Wellington, Napier, Marton, Taranaki, Waikato, Manawatu, Poverty Bay, Marlborough/Canterbury, Auckland, Hawkes Bay, Southland, Wanganui, and South Canterbury reported on Branch activities in their areas. The magazine, being a commercial enterprise, obviously had to carry advertisements. The following companies took full-page advertisements including those in two colours on the front and back covers: Radiothon Valves, International Radio Co. (which sold National Union valves), F.J.W. Fear – radio kit sets, McMillan Radio Supplies, Radioke kit sets, Thos. Ballinger radio kit sets, A.W. McCarthy – spare parts, British Trading Co, STC,-Raython valves, and Seimens – batteries. There were also several half-page advertisements. not known whether this figure was derived from the number of subscriptions or the number of allocated DX call signs given out by the DX Club from the time of its inception. In 1932 there was growing dissatisfaction by some DX Club members that the club was basically run by a publishing company. They felt that the quality of the material published in the Radio Log section was not as up to date as it should be. Some members in the South Island wanted a democratic DX club run by the members for the members. and a call book section as well as DX news etc. The club was the first official DX Club in New Zealand and prospered for more than 70 years. Although early DXing was mainly confined to the broadcast band, probably due to the limited availability of shortwave receivers, there was a small but enthusiastic following of shortwave DXing. These listeners tended to listen to all shortwave signals, ranging from the limited number of international broadcasters through to radio amateurs, shipping and other CW signals. In the May 16 th 1930 issue of the Radio Record a list appeared of the shortwave stations heard during the previous week. shortwave it eventually closed. Their monthly publication was a newssheet type of publication called the NZ Shortwaver, which members received for a 5 shilling annual subscription. It is of interest to note that the 1934 NZART call book shows the callsign ZL2QZ , N.Z.S.W.R.C., under A.McDonaugh’s name and address and the trustee being Roy Clark ZL1AW. 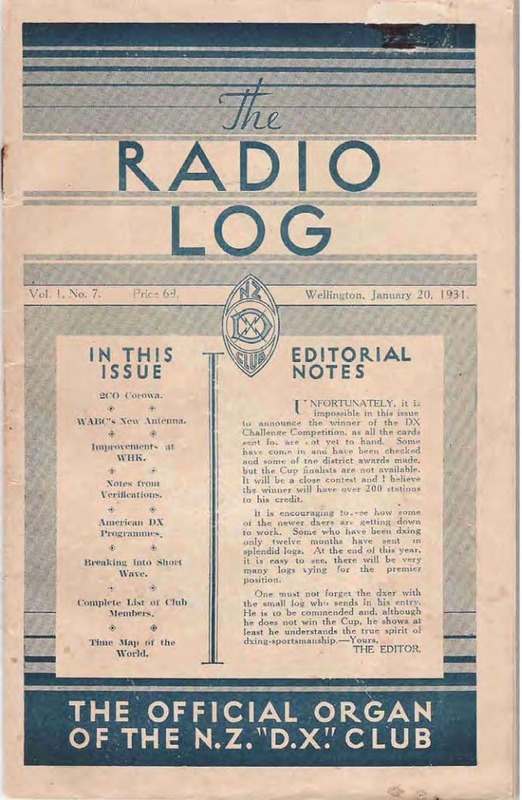 Early 1932 saw pressure mounting from DX Club members that a president of the club be elected, rather than appointed by the publishers of the Radio Log. 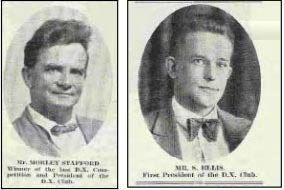 Nominations for president were called for, and DX Club members voted in August 1932. The first president of the DX Club, Mr S. Robson, was elected by a narrow margin. During the same month, the editor, who always remained nameless, visited the main centres to explain the various clauses of a proposed constitution for the club. In brief they were; To establish an advisory board of 4 directors, together with a permanent chairman, who is on the editorial staff of the official organ, the New Zealand RadioTimes. To introduce the district scheme whereby branches have a chain of authority up to the head office in Wellington. An entrance fee of 2/6 to be paid to head office, and an annual fee of 1/- to be paid to the district headquarters. In 1933 nominations were called for, to fill the positions on the Advisory Board. As only 4 were received, no elections were necessary. L. Illingworth and J. P. Cowlishaw represented the North Island, while S. Robson and D. N. Adams represented the South Island. Even though a slight degree of democracy had come to the club, discontent from certain branches continued. The editor of the Radio Log publicly admitted at the end of 1932 that all was not well within the DX Club. Members of the southern branches of the club had withdrawn and it appears that the main reason for discontent was the quality of the DX news appearing in the DX Log, and the proposed constitution.The division had grown to such an extent that the publishers of the magazine were claiming poaching of material from the Radio Log by one of the breakaway branches. 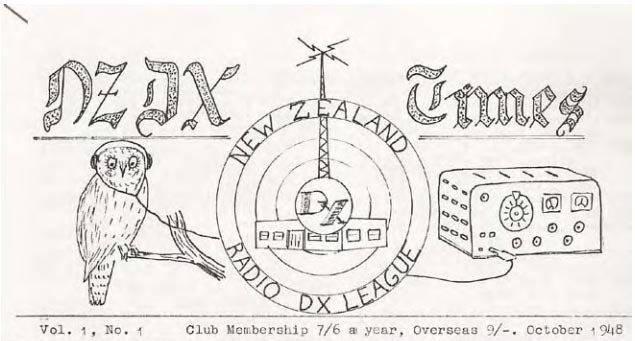 In 1939, members of the NZ DX Club began negotiations with the publishers, National Magazines, for DXers to take over the independent running of the DX Club. After 7 years of incorporating The Radio Log with the Radio Times, the publishers were happy to be relieved of the running of the DX Club. It was soon realised that the NZ DX Club was not in as strong a position as had been expected. Instead of 20 active branches listed in the Radio Log, the new owners found there were only 2 branches actually operating, Auckland and Southland, and the Auckland branch was more interested in running regular dances than DXing. In September 1939, Auckland became Headquarters for the NZ DX Club and Southland produced the NZ DX-TRA, the new name for the club magazine. When the President visited the Southland branch on one occasion it was revealed that he did not possess a radio. Disagreement soon grew between the Southland and Auckland branches, due to the fact that the NZ DX Club was losing its DXing direction. By 1947 dissention had grown in the South to such a point that Otago and Southland DXers met in Dunedin in September and the decision was made that, over the next 12 months, a new DX organisation would be formed by the Otago and Southland Branches of the NZ DX Club, if a more practical arrangement could not be made with the Auckland Headquarters. remit at a Radio Association conference had failed. At this stage Mr Greenway tabled a letter from the Radio Association Headquarters agreeing to the meeting of the two branches, and the advising of Headquarters not being adverse to amalgamation. Mr Whitworth outlined the financial position of the NZ DX Club as far as it was known. Mr Stanton then stated that the NZDXRA finances were satisfactory although in debt, and that another issue of the Call Book would wipe out any deficit. It was duly revealed that there were 300 subscriptions to the NZDXRA’s magazine Tune In and a like number to the DX Club’s DXTRA. Several discussion points were resolved at this meeting and were to be put forward to the respective headquarters. Name; The “ New Zealand DX Radio Club “was the preferred name with the “ New Zealand DX Association“, being second choice. Call Book It was agreed that the current call book was a good publication and should continue to be published in Dunedin. Considerable discussion took place on the location and format of the DX magazine. Mr Greenway was in favour of a printed magazine while others preferred duplicating the magazine with the aim of supplying DX information faster. It was finally moved that the magazine be published in Invercargill and the style be left until the matter of finance became clear. After much discussion it was moved that Headquarters be located in Wellington. It was felt that the location of both the Headquarters and the Magazine Committee be voted on annually. Finally it was moved that a report of this meeting be circulated by the respective headquarters to their branches, and that a reply be received not later than the 17 November. However after the above meeting the situation did not change, and in August 1948 the Otago and Southland Branches broke away from the NZ DX Club to form the New Zealand Radio DX League. By June 1948, issue # 106, the New Zealand DX-TRA was down to 8 duplicated foolscap pages and contained minimal current DX material. The club was now in dire straits and this was reflected in the leader on the front page, “It brings us to the end of another financial year which has been one of the most difficult in the history of our club“. A request was made to return voting papers along with 6/6 for next years subscription. The Annual General Meeting was to be held on the 10th July in Auckland where Headquarters were located at that time. The June 1948 issue of the DX-TRA had been sent to “a number of persons who were financial members at some time previously with the hope that they may once more become financial members of our club”. Desperate measures were needed. The first two pages of that magazine were mostly club news. On page 3 Shortwave Mailbag listed contributions from 9 members and only took half a page. The balance of the page was taken up with Shortwave Notes from overseas sources. The following page was devoted to a sample of how to fill out a Spanish report form. Page 5 listed Australian frequency changes and 7 small contributions to the Broadcast Mailbag and the last page covered radio amateur loggings and new American broadcast stations. The last 2 pages were shortwave news from overseas magazines. The magazine and club were in serious trouble. those funds. There was disappointment shown, with only 74 voting papers being returned. After the previous month’s call for more member contributions to the magazine, all sections were better supported. However this was not to continue and within the year the NZ DX Club ceased to function. There is no record of the club ever being officially wound up. So ended an organisation that played an important role in New Zealand’s early radio history. Nevertheless the DX hobby continued to thrive in New Zealand with the established NZ Radio DX Association and the newly formed NZ Radio DX League. Absolutely fantastic piece of research, Barry. Great work. Thank you.